Here comes another entry into the already crowded smart watch and fitness tracker space. 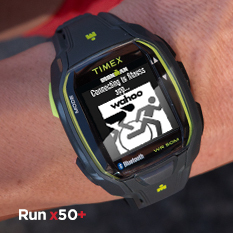 AT&T will be taking preorders for the Timex Ironman One GPS+ smart watch for $399.99 beginning November 7th. The watch offers one year of wireless service, as it operates without the need to be tethered to an iOS or Android device. It allows those who go for a run to leave their device at home and still receive email and messaging while tracking their speed, distance and other fitness stats. The Ironman One GPS+ has 4GB of onboard storage, which allows for listening to music via a paired bluetooth headset. It is water resistant to 50 meters and sports a Mirasol display. Seeing as the Ironman One GPS+ was created in collaboration with Qualcomm, this should be no shocker. The 450mAh battery is stated as providing 8 hours of use with GPS and cellular connectivity enabled or three days of standby.